The NFL spent Sunday protesting President Trump, and all he worried about were TV ratings. After players from nearly every NFL team demonstrated on the field over Trump’s feud with the franchise, Trump fired back in the afternoon with a tweet diminishing their dissent. “Great solidarity for our National Anthem and for our Country. Standing with locked arms is good, kneeling is not acceptable. Bad ratings!” Trump wrote. Minutes later, he boasted about how at least one sports team — the NHL’s Pittsburgh Penguins — wasn’t abandoning him. “Please to inform that the Champion Pittsburgh Penguins of the NHL will be joining me at the White House for Ceremony. Great team!” he said. 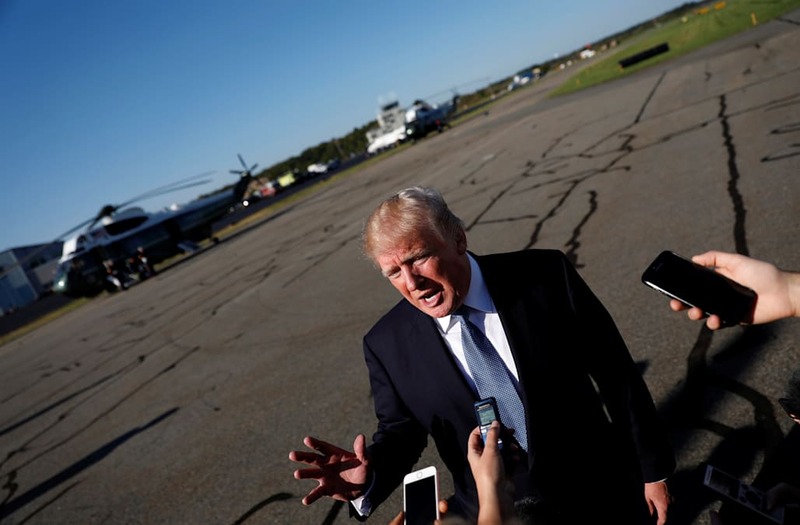 Trump, arriving at Morristown Municipal Airport from his Bedminster, N.J. golf club Sunday, said his comments about athletes kneeling during the national anthem had "nothing" to do with race, according to a White House pool report. In another tweet, Trump wrote, "Courageous Patriots have fought and died for our great American Flag --- we MUST honor and respect it! MAKE AMERICA GREAT AGAIN!" Trump also retweeted two anti-NFL posts from right-wing activist Donna Wood, including a tweet calling for a boycott of the NFL. NFL players turned their Sunday games into political statements after Trump for the third straight day criticized the league for letting players kneel during the national anthem. Dozens of players kneeled or locked arms during the anthem Sunday as their team owners issued statements supporting the protests. Even the singer at Detroit’s Ford Field, Rico Lavelle, finished the anthem on a knee. Trump in his tweet did not seem to understand that the locked arms, like the kneeling, were a form of team protest. He also continued to falsely imply that the kneeling is a protest against the American flag. Former San Francisco 49ers quarterback Colin Kaepernick kicked off the kneeling last year as a demonstration against racism. "I am not going to stand up to show pride in a flag for a country that oppresses black people and people of color," Kaepernick explained in one post-game interview. In the middle of Trump's weekend war against the NFL, the President also went after the NBA by announcing on Twitter he was withdrawing his White House invitation to Stephen Curry of the champion Golden State Warriors. The Warriors had been split about whether to accept Trump's invite and Curry said in advance that he planned to vote against going to the White House. But the Pittsburgh Penguins, who won the NHL's Stanley Cup, have said they will stick with their White House invite, even as they support protests in the sports world. "Any agreement or disagreement with a president's politics, policies or agenda can be expressed in other ways," the team said in a statement. "However, we very much respect the rights of other individuals and groups to express themselves as they see fit."